Pre-sales are available until Sunday, September 1th, 2019, at midnight - after this date and time, you can only buy tickets on site at the festival. Don’t worry, we won't be sold out ! BE CAREFUL : pre-sales tickets (printed, on smartphone, tablet or portable) will be scanned at the entrance of the festival site ; once a ticket is scanned, it is registered ; if someone wants to use the same ticket again, it will be refused. Don't forget to download your ticket via the link given in the payment confirmation email. If you forget your pre-sale ticket, you won't be allowed to enter the festival site, unless you buy a new ticket on site. We do not refund pre-sales. You can buy a cancellation insurance from the internet ticketing service, or sell / give the ticket to someone else yourself if you can’t make it. Free entrance for children under 12 years of age if accompanied by an adult. Pre-sales only for 3 days pass. One day tickets will be sold only on site. All tickets can be purchased on site at the entrance, but you will pay more than by buying a pre-sale pass. We do not run out of tickets, so don’t worry about the event being sold out. You are free to financially support the festival by making a 5 € (or more) donation. You can make a donation when buying your ticket(s). In short, it’s up to you to contribute a little, a little more, passionately more or not at all to the festival. 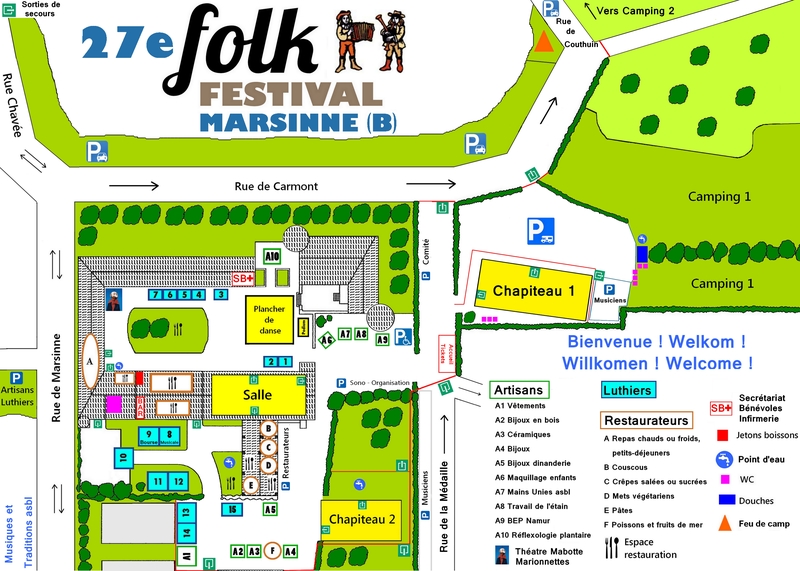 This donation helps the Marsinne Folk Festival develop and ensure the comfort of festival-goers (WC, showers, tables, chairs, catering, ....), increase the budget of artists and craftspeople, and invest in better equipment (electrical installation, sound system, light, ...). And all this by keeping ticket prices at a reasonable level and not asking for more subsidies. 120 people donating 5 €, that already makes up 1% of the festival’s budget ! Be careful ! ONLY cash payments are available on site, NO credit card NOR bank cheque. If you have the exact amount, that’s even better !